Tanya Khovanova's Math Blog » Blog Archive » Great Ideas that Haven’t Worked. Yet. Great Ideas that Haven’t Worked. Yet. I’m trying to lose weight. Many books explain that dieting doesn’t work, that people need to make permanent changes in their lives. This is what I have been doing for several years: changing my habits towards a healthier lifestyle. This isn’t easy. I am a bad cook; I hate shopping; and I never have time. Those are strong limitations on developing new habits. But I’ve been a good girl and have made some real changes. Unfortunately, my aging metabolism is changing faster than I can adopt new habits. Despite my new and improved lifestyle, I am still gaining weight. But I believe in my system. I believe that one day I will be over the tipping point and will start losing weight, and it will be permanent. Meanwhile I would like to share with you the great ideas that will work someday. Only dark chocolate deserves to be eaten. Corn syrup, artificial colors and sweeteners are poison. I have Boston Organics fruits and vegetables delivered to me every other week. Initially they all rotted and I had to throw them out, but I am stubborn. Now I’ve learned how to make a turnip salad and how to enjoy an apple. I will soon switch to a weekly delivery. When I’m in a restaurant, I have a rule that I must order vegetables. I do not have to eat them, I just have to order them. But since I do not like things wasted, I end up eating at least some of them. Now I’ve grown to like eggplants and bell peppers. I buy precut frozen cakes. When I am craving sugar, I defrost one piece. A while ago I would have finished the whole cake the day I bought it, but now, after one piece, I am usually too lazy to defrost another. I buy fewer sweets now. Actually I buy exactly one desert item, as opposed to the half a shopping cart I used to buy. I used to rationalize that I need deserts to serve potential guests. Then I would eat all the sweets myself. Now I’ve decided that my friends will forgive me if I don’t serve desert. Three of my girlfriends and I signed up for the gym together. Without them, I would have dropped the gym a long time ago. Natasha’s call inviting me to yoga often is the extra push that I need. Now, several years later, the habit is formed and when necessary I go alone. I have a separate computer for games. I put it on top of my bookcase, so I have to stand while playing. This way I can’t play for too long, and burn extra calories at the same time. I have many other ideas that for different reasons haven’t yet become habits. So I am thinking about tricks to turn them into habits. Start every meal with water. I keep forgetting to start my meals with water. Besides, I do not like plastic bottles. So now I’ve bought glass bottles with protective sleeves to carry in my car and my bag conveniently. They look so cool that I enjoy sipping from them. I never exercise in the mornings, because I want this time for mathematics. But in the evenings I am often too tired and skip my scheduled gym sessions and dance classes. I often spend the whole day inside in my pajamas. 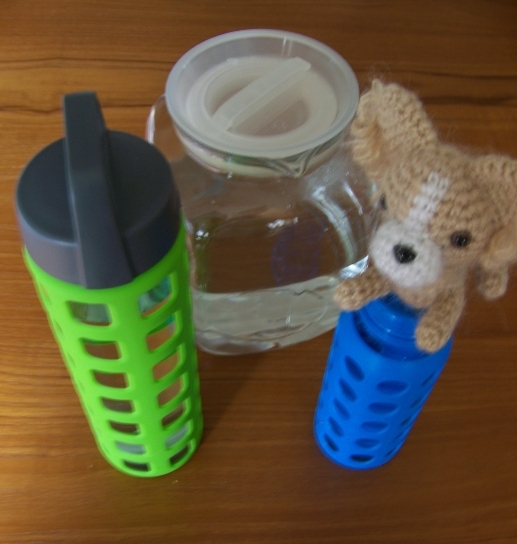 So to help me to exercise daily, my friend crocheted a small toy dog for me. Now I pretend that it’s a real dog that needs to be walked every day. I have many more ideas, but I gotta run now. I need to walk my dog. Some great ideas there. I order a fruit and veg box weekly and some of it does go mouldy but it’s getting better. Good luck with it. The ideas are brilliant. Mathematically correct, and engineeringly executable. As far as I can tell that is what people who don’t have issues with eating and weight do; better follow them than a legion of dieters, right? Also, no point coming up with a “great” plan that one cannot follow through. Good luck! It all sounds very sensible, good luck! I know some people who actually use it when they are writing or typing, for me it would be very hard to think when I am walking. “Magnesium is an essential element in biological systems. Magnesium occurs typically as the Mg2+ ion. It is an essential mineral nutrient for life and is present in every cell type in every organism. For example, ATP (adenosine triphosphate), the main source of energy in cells, must be bound to a magnesium ion in order to be biologically active. What is called ATP is often actually Mg-ATP. Similarly, magnesium plays a role in the stability of all polyphosphate compounds in the cells, including those associated with DNA- and RNA synthesis. The less magnesium you have, the more time it takes for some amount of fat or glucose to be burned. This means that for some given metabolic rate, you need to have more energy reserves, so you will end up fatter. Vitamin D deficiency will cause your body to save energy by cutting down on muscles etc. which then limits its ability to burn energy. That’s obviously not what you want. I take 10,000 IU/day in Winter, I have been doing this since a few years and I’ve found that it helps with recovery from exercise. A few years ago I exercised 3 times a week, 20 minutes running, now I do 45 minutes of running, 5 times a week. My resting heart rate has dropped from 45 bpm to 37 bpm. 1) Practice allowing yourself to be slightly hungry from time to time, and eat more slowly. You don’t have to start eating at the slightest sign of hunger, and you don’t need to keep eating until you feel stuffed. 2) Give yourself a “sugar budget”; e.g. you’re only allowed to buy 100g of sugar in all your groceries per week (only works if you’re cooking your own food). 3) Make sure you have plenty of other stuff to think about to keep you distracted from thinking about food. These are some really clever ideas. However, one thing i wouldnt recommend is drinking water before every meal. Drinking water immediately before and immediately after a meal is bad for digestion because it dilutes the gastric juices. Instead, how about starting every meal with a salad or filling your plate with veggies before you eat anything else?